You are currently browsing articles tagged Paul Galanti. In today’s increasingly troubled society, there is a desperate need for role models, especially among the youth. Colonel John W. Ripley, USMC is an authentic American hero and a true role model, whose life is worthy of admiration and emulation. Known for his impressive heroics during the Vietnam War, Colonel Ripley earned the Navy Cross, along with numerous other awards. His legendary career in the United States Marine Corps is well-known, but now, for the first time ever, a new book that covers his whole life — from his adventure-filled boyhood in rural Southwestern Virginia to his days at the U.S. Naval Academy, his tours of duty in Vietnam, his post retirement years and finally, the final days before his death — is soon to be released. 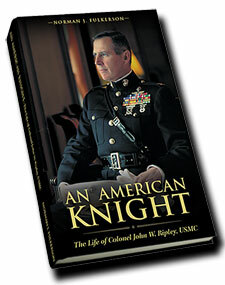 In An American Knight: The Life of Colonel John W. Ripley, USMC, TFP author Norman Fulkerson succeeds in telling the fascinating story of this legendary Marine, whose ancestors fought in every American conflict since the Revolutionary War. **Colonel Ripley’s deep Catholic Faith, his love for his children and his devotion to his wife, Moline. **His many struggles, one of the last being his liver transplant, described by his surgeon as the “most dramatic” one in history. **The ultimate warrior whose Faith, discipline and morals provided him the strength necessary to vanquish enemies in battle. **The gallantry of a man who faced public opinion and political correctness when he opposed homosexuals in the military and women in combat. **How he transformed youthful energy into a determination and ultimately success at the US Naval Academy. **How he stopped a Communist tank column and 30,000 NVA dead in their tracks. This makes An American Knight a splendid and inspiring tribute to one of America’s greatest fighting men, whose legacy will deeply mark the souls of all those who love the virtues of the medieval knight: Faith, honor, heroism and integrity. “In his new book An American Knight, Norman Fulkerson has vividly captured the extraordinary active journey in life of Colonel John Ripley. In this first ever biography of a truly legendary Marine, the reader will see a man of many images; a gentle person who was comfortable with people of all stations of life, a caring father, a faithful husband, and a Marine capable of doing the seemingly impossible when I ordered him to destroy the Dong Ha Bridge. 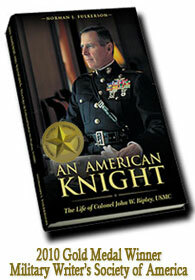 To pre-order your copy of An American Knight: The Life of Colonel John W. Ripley, USMC, by Norman Fulkerson, visit www.americanknight.org or call 1-888-317-5571.